Broccoli: Broccoli is bountiful this week. If you find yourself with more than you can use this week try freezing some. For best freezing results cut into equal sized pieces, blanch in hot water for 1-2 minutes or until broccoli develops a bright green color. Cool under running water and put it in a plastic freezer bag. Garlic Scapes: In the life cycle of garlic its attempt at flowering and producing seed creates what we know and enjoy as the “scape”. This long green scallion like shoot has a relatively short season, so enjoy them now while they last. The entire scape is edible and delicious, from tip to stalk. They are great added fresh to salads, and can also be used as you would garlic cloves in almost any cooked dish. Napa (Chinese) Cabbage: This Chinese type cabbage is exceptionally light, aromatic and sweet in flavor. The creamy white blanched interior is great cooked or raw. Turnips, Hakurei: It’s the year of the turnip! This week we planned radishes for your share, but due to the persistent and heavy spring rains the radishes developed splits in the field. While the radishes struggle the Hakurei turnips have been thriving, and they are taking their place of radishes this week. Of course there are more turnip recipe ideas in the blog for those of you wondering what to do with all those turnips. Note: Originally this recipe calls for just broccoli, but Napa (Chinese) cabbage is also wonderful prepared this way. Try adding some sliced up Napa cabbage in with the broccoli, or you can use substitute a head of Napa cabbage for the broccoli to try it on its own. Heat oil in a large skillet over medium-high heat. Add garlic and ginger and cook until fragrant but not browned, 30 seconds to a minute. Add broccoli and cook, stirring, until the broccoli is bright green, 2 minutes. Add in Napa cabbage and drizzle water and fish sauce over the broccoli and cabbage; reduce heat to medium, cover and cook until the broccoli is just tender, about 3 minutes. Stir in vinegar just before serving. Makes 4 servings, about 1 cup each. Allow the grated cheese to soften at room temperature for easier mixing. Use a food processor or mixer to whip the cheeses together until smooth and well blended. Add the remaining ingredients. Makes about 2½ cups. Note: This dressing is great with a quick green salad; you could use any combination of all the items in your share this week with lettuce, arugula, and/or Napa cabbage as the greens. Combine mayonnaise and sour cream; gradually stir in milk, mixing well. Stir in remaining ingredients. Cover and chill several hours. Serve with salad greens. Makes 2 cups dressing. Wash and dry all the green, then toss them together in a bowl. Mix the shallot and lemon juice and zest with ¼ teaspoon salt, then whisk in oil to taste. Toss the greens with a few pinches of salt, then with the dressing. Mound onto plates and serve. Serves 4. In order to offer you some additional culinary inspiration we have been picking the brains of some of the areas most talented chefs and restaurant owners. We have asked them to provide us with recipes and general cooking techniques based on the crops that you receive in your shares during the month of June. This month our featured chef is Katherine Deumling, owner of Cook with What You Have cooking school located in inner SE Portland. I have a small business called Cook With What You Have. 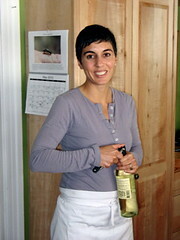 I teach cooking classes primarily from my home in inner SE Portland. I help people build their skills, gain experience, learn to taste and improvise and learn how to stock their pantry and shop/source so that cooking is more of a pleasure and less of a chore. 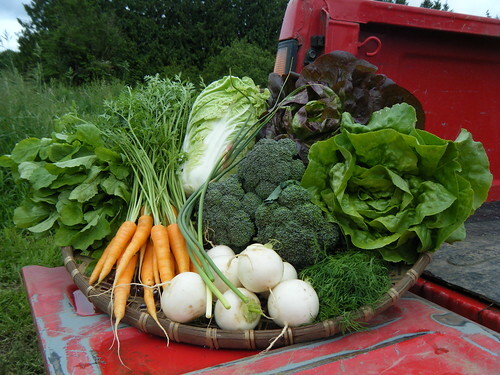 Local produce is the heart and soul of my work, rain or shine, June or January! My garden, my CSA share, and the farmers markets supply all of the produce for classes and daily meals for my family. Many more details and my summer class schedule at my website and my blog, where I post recipes weekly. And I am offering SIO members, $10 off my summer classes. Contact me at Katherine@cookwithwhatyouhave.com with any questions or for more information. Through my work with Slow Food Portland, I have been familiar with, and a fan of, Sauvie Island Organics for many years. SIO has hosted some of the most memorable Slow Food Portland events-events in support of farmers and the critical work of advocating for and educating consumers about local farms and food. I grew up in a creative family with a make-do-with-what-you-have mentality and we often lived far from the nearest grocery store. My mother always had a large and varied vegetable garden, and loaded shelves of home-canned goods. So I grew up cooking with what was in the kitchen, garden, and pantry most of the time. After years of cooking for my family (and now with a three-year-old underfoot) and friends, I have refined delicious, healthy, and often quick meals based on the abundance of wonderful produce and products in our regional foodshed. I have studied food and culture in Italy and Mexico and grew up in Germany. I have also worked in restaurants. My primary experience comes from feeding groups of people on the fly in many settings with whatever is available. My cooking is mostly rooted in Italian cuisine and is influenced by German, Italian, Mexican, and Thai traditions. Carol Boutard of Ayers Creek Farm told me about this method of cooking fava beans which eliminates the time consuming step of peeling each individual bean. I don’t think I’ve ever gone back to the other way. This is an Iranian way of cooking favas. Fill a six-quart pot (or slightly larger) three-quarters full of water. Add salt and bring to a boil. Put the whole fava beans, pods, stems and all in the boiling, heavily-salted water. Bring back to a boil then turn down to medium but keep the water at a lively boil. Occasionally press the fava beans down and move around a bit. Cook covered, until the pods start falling apart, between 20 and 30 minutes. Drain and fill pot of beans with cold water. This allows you to extract the beans more quickly. You can also just drain and let sit until cool. Remove beans from pods. There is no need to peel each individual bean. The skin should be tender and the beans perfectly seasoned. Toss beans with the remaining ingredients. Adjust seasoning to your liking. Enjoy as a side dish. Fava beans cooked this way are delicious with pasta and a bit of parmesan, with boiled potatoes and parsley. The other night I added them to Israeli couscous with some mint and grated, hard cheese (Asiago Stella, I think). Spread carrots and beets on a rimmed baking sheet, sprinkle with salt and drizzle with olive oil and roast in a hot oven (425-450) for about 20 minutes until tender and slightly caramelized around the edges. Meanwhile wash and dy the greens and roughly chop hard-boiled eggs. Mix all dressing ingredients well. Then toss the greens with the roasted veggies, eggs and dressing and enjoy as a light summer supper. We ate this recently with cheesy cornbread muffins. The muffins were an adaptation of a recipe from Michael Ableman’s Fields of Plenty. I added grated sharp cheddar, a pinch or two of chili flakes and a bunch of finely chopped chives. In a saucepan bring 7 cups water with 10 tsps of homemade veggie bouillon to a boil and keep at a bare simmer (or just use a chicken or veggies stock of your choice. In a large sauté pan cook onion in oil over medium heat, stirring, until softened. Stir in rice, stirring until each grain is coated with oil and cook for 2 minutes. Add wine (if using) and cook, over moderately high heat, stirring, until wine is absorbed. Add about 3/4 cup simmering broth and cook over moderately high heat, stirring frequently, until broth is absorbed. Continue adding broth, about 3/4 cup at a time, cooking, stirring and letting each addition be absorbed before adding the next, until about half of broth has been added. Continue adding broth in the same manner until rice is tender and creamy looking but still al dente, about 18 minutes. A few minutes before the rice is tender stir in the spinach and a cup of broth. Cook for a minute or two until spinach is wilted. Salt and pepper to taste. Add butter and parmesan and a little more broth is it looks a bit dry, mix well and remove pan from heat. Let rest for 5 minutes, covered, before serving. If you don’t happen to have feta and harissa on hand, I make a simpler version of this salad without those and if you have cooked chickpeas on hand, it makes for a nice hearty salad. In a small sauté pan, cook the garlic, caraway, cumin, paprika, harissa and sugar in the oil until fragrant, about one to two minutes. Remove from heat and add the lemon juice and a pinch of salt. Pour over the carrots and mix. Add the herbs and mix. Leave to infuse for an hour if you have time, at least a 10 minutes, then add the feta before eating. Harissa: Is a North African chile paste. There is almost nothing it doesn’t make more delicious: eggs, potatoes, stews, couscous, sandwiches and more, and there are almost as many recipes as there are people who consume it. Most boil down to hot chiles ground with garlic, cumin, coriander, caraway and olive oil, often with a smidge of sundried tomatoes. You can make your own or you can find it at Pastaworks or other local specialty stores. Wash a large bunch of fresh chard. Separate the leaves from the stems and reserve stems for another use. Cut the leaves into 1-2 inch ribbons. Slice a large onion and begin stewing it in some olive oil in a good-sized pot or pan. When the onion has softened a bit add the chard, season with salt and pepper, cover and stew, stirring occasionally for 20-30 minutes. You can add garlic, bacon, or lemon zest but just by itself it is sweet and wonderful. I’ve used this as a pizza topping with some feta or for a filling for a savory tart, as a pasta sauce or just a side to whatever else I made for dinner. Also wonderful with eggs. This is Southern German style tart/quiche/pizza is a mainstay in my family. Growing up in Germany we spent one year in a small village in Swabia (this was 1977 I think) that had a communal “backhaus” that was fired up with grape prunings once a week and everyone in the village would bring their tarts like this one, their breads for the week, etc. and take turns baking them in this wonderful big, ancient “baking house” – kind of like a giant wood-fired pizza oven. This can easily be made vegetarian by omitting the bacon. You can also add herbs (parsley and/or thyme are particularly good) and change the cheese to suite your taste or what you have on hand. 4 ounces grated sharp cheddar, Emmentaler, etc. For the crust, in the medium bowl beat the egg with the oil, water and sour cream (or yogurt) until just mixed. In another bowl mix the flour, salt and baking powder and stir into the wet ingredients with a fork or wooden spoon. Mix well – you may want to use your hands at this point-until it’s smooth. Place the dough in a 13 x 18 rimmed baking sheet (sheet pan) and roll it out to fit the pan. You may have to stretch it a bit with your hands to get it into the corners. It does not need to come up the sides at all. For the filling, slice the onions in half and then into ¼ thin half rounds. Thinly coat a large sauté pan or pot with olive oil and heat it over med-high heat. Add the bacon and cook for a few minutes until the fat is partially rendered. Add the onions and a few generous pinches of salt. Cover and stir occasionally (and adjust heat if onions stick and brown) until the onions are quite soft and some of the liquid they’ve released has cooked off. This will take between 15 to 25 minutes depending on your onions. Ideally they don’t brown but no harm done if they do. In a large bowl, beat the eggs with the sour cream (or yogurt), a few grinds of pepper. Add the grated cheese and the onion bacon mixture. Spread on the crust and bake for 35 to 45 minutes until the top is golden and the edges are starting to brown. Eat warm or at room temperature. This is even better reheated the next day in a hot cast iron pan in a little bit of olive oil.